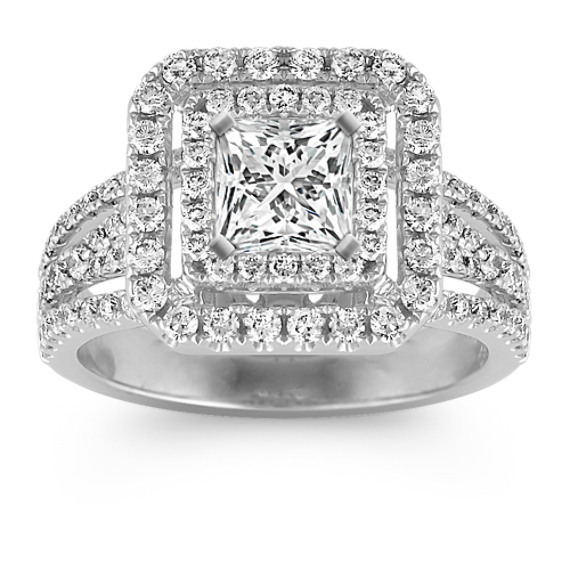 Princess Double Halo Diamond Engagement Ring | Shane Co. This stylishly stunning double halo engagement ring boasts 124 round diamonds, at approximately .88 carat total weight, crafted in quality 14 karat white gold. Hand-matched for superior sparkle and fire, these gems rising up the split shank setting will perfectly accent the 1.00 carat princess cut diamond of your choice. This ring is part of our exclusive Couture by Shane Co. collection. Gemstone Carat Weight :7/8 ct. t.w.